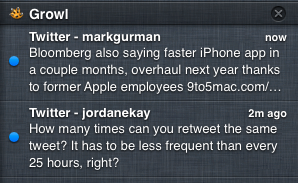 Growl is a notification app for OS X that predates the idea of Notification Center on OS X or iOS. I have used it for years, and it is supported by a vast majority of Mac apps, including high-profile ones like the official Twitter client. When OS X 10.8 was announced, many people assumed Growl was dead. Growl uses its own banners and a “Rollup” window (a place to collect missed notifications), so it seemed the overlap was too large and there would only be room for one notification system on OS X. However, a new app called Hiss seeks to unify the two systems by putting your Growl notifications right into your Mountain Lion Notification Center. I played around with it today, and it seems to work pretty well. It grabs any incoming Growl messages and stops them, and then it replaces them with native OS X notification banners that stack up in Notification Center just as you would expect. Hiss is a good way to integrate the two systems, but it is held back by a few technical details. Where regular apps are separated into individual sections, Growl notifications all stack up under the name “Growl”. The only way to tell which app a notification came from is to check the first part of the notification title. This is because the apps are not sending the notifications, but rather Hiss is pulling them from Growl. This also means that all notification banners will show the Growl icon and not the icon of the app sending the actual message. This gets rather annoying and confusing when you have several apps trying to send notifications at once. When an FTP upload transmits, a mention in Twitter for Mac occurs, and the CloudApp processes an upload, and each try to notify you all at once, it can be hard to catch which apps are notifying before the banners disappears. Clicking banners or Notification Center items does not switch to the correct app (due to the fact that Growl is sending the notifications). Switching to the app in question also does not remove its items from Notification Center—as would happen with an app supporting Apple’s system. Growl announced its plans to bring similar integration to version 2.0 of its product in a blog post after the Mountain Lion preview at WWDC. Until that happens, technical limitations notwithstanding, Hiss is your best bet for merging OS X’s native Notification Center and Growl’s widespread integration with many popular apps.